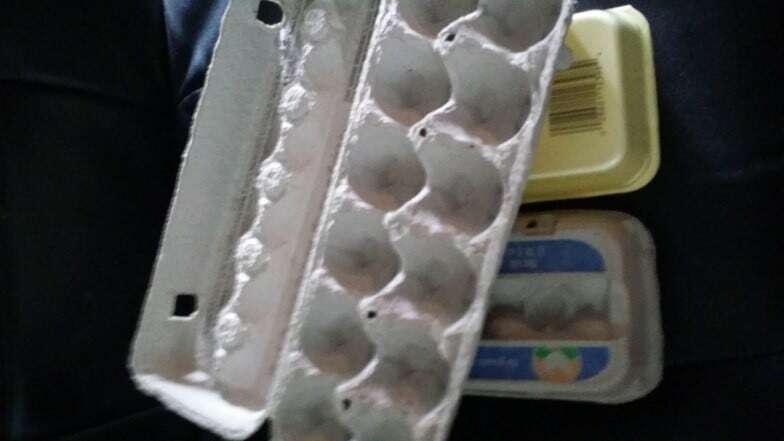 Did you know that those cardboard or Styrofoam egg crates can be used for survival purposes? When SHTF there are going to be a lot of conveniences and luxury items that quite simply just won’t be available. At best, they won’t be readily available and trying to get your hands on some products that make life easier could be too risky to be worth it. So your choice at that point will be to go without the product or find an alternative that works. You will find tons of articles out there suggesting things that you should hoard now in preparation for a SHTF scenario. But egg crates don’t always make the list. Granted storing a lot of egg crates will take up some space in your garage or shed, and storage space is always at a premium, but you can stack them together to conserve space. Instead of throwing your used egg crates away, keep them and re-use them or store them for a SHTF scenario. When storing egg crates for survival use do it properly because of the risk of salmonella and other bacteria that is present in raw eggs. Make sure you wash Styrofoam egg crates thoroughly with soap and warm water. If your cardboard egg crates get dirty, show a ring at the bottom, or an egg breaks, leaks, or sticks inside, just discard it. It’s not worth the risk and cardboard egg crates can’t really be thoroughly washed out. You can use a bleach and water solution and quickly dip a fairly clean cardboard egg carton into it to sterilize and then hang them to dry. Do not use bleach directly on Styrofoam, use a diluted solution on a rag or paper towel to wipe them out and then hang to dry. Fire Starters –cardboard egg crates are great for survival because you can pack them with just anything that lights easily and use them as fire starters. Things to consider for tinder to be packed inside include Vaseline-soaked cotton balls, dryer lint soaked in wax or rubbing alcohol, or even sawdust that has been mixed with animal fat or Crisco shortening. Mosquito and Insect Repellent—Everybody knows bugs hate smoke. If you are isolated enough and aren’t worried about attracting attention to yourself, you can burn cardboard egg cartons. They will smoke and help repel mosquitos and other insects. Do not try this with Styrofoam cartons as the fumes will be highly toxic. Use as Trivet—If you need to take something out of the hot fire and don’t want to set it directly on the ground or even on a table, you can open up several CARDBOARD egg crates and turn them upside down. Set your hot pan or plate on top and you’ve got an instant trivet that either protects your table or keeps your food up off the ground and out of the direct path of insects. Use as Seed Starters—Use empty egg crates to start seeds. Puncture the bottom of each well in two places, add a little soil, water, and plant your seeds. Instant seed starting garden! Better yet, when you take your eggs from the crate and break them to use them in your recipes, put the empty shells right back into the crate. You can start seeds right inside the broken egg shells. If you live in a colder climate and want to start seeds even earlier than usual, you can enclose the egg carton in a clear plastic bag to hold in heat. When it’s time to move the tiny plants into the outside garden, simply pull out the plant, crush the shell around it a bit, place it in the hole, and cover with dirt. The egg shells provide calcium to the roots and soil. The sharp broken edges also serve as a barrier of protection against crawling insects that will try to eat all your plants. Use as bobbers or markers when fishing. You might not need to worry about this if you packed your bug out bag with a fishing kit, but if not, you can use egg crates as bobbers. Cut into twelve pieces or sections. Puncture the bottom of each section and thread your cord or string through. You will want to string two pieces together with the open sides facing one another. Position along the net or string where you need it and then fasten the two sections together with glue, sap, or an alternate substance to seal. Styrofoam crates will hold up longer than cardboard ones of course. This is the original intended use of course but during a post-SHTF scenario, you will need to preserve your eggs using mineral oil so you can extend their shelf life. Keeping them in cartons means they stay secure and separated. Keeping them in cartons reduces chance of breakage during storage also. Cardboard or recycled paper crates can be used to enhance compost by tearing into small pieces and mixing in with the rest of the pile. You may want to discard any cardboard that has ink markings on it to keep dyes from getting into the soil. One menu item you may not have considered yet for a SHTF scenario is edible insects. But if you are stuck in your safe room or if you think you may run out of food at your bug out location before you have a garden that produces, then raising your own insects might be an option. Due to the trends in pesticide use nowadays, make sure you research how to raise edible insects safely. Edible insects, such as crickets and grasshoppers, can be kept in cardboard egg crates until they are needed. One crate can actually house several hundred crickets. If you have somewhere else to keep your crickets, you can tear up cardboard egg crates to use as food for the crickets. Avoid using ink dyed parts of carton. Egg crates, whether made from cardboard or Styrofoam, can make great containers to organize all those little odds and ends. Use them to store things like extra buttons, hair ties, bobby pins, or safety pins. You can use them as well to store nuts, bolts, washers, screws, and all those other little pieces that are so vital but can get lost easily. Making time for fun is going to be crucial for mental health, especially for kids. Use a cardboard or Styrofoam egg crate to make your own mancala game to take everyone’s mind off of things for a little while. For mancala pieces, consider using marbles, beads, even dried beans or small pebbles, whatever is available in your area. You can also use egg crates as organizer cups to hold paints or dyes, make a one-time floating boat, or turn into paper flowers. If you cut cells apart, you can use them as makeshift checker pieces and draw a checkerboard in the dirt or on paper. Or you can string or glue multiple pieces together to make a toy train or toy caterpillar. Keeping noise to a minimum is crucial during a SHTF situation. This can be especially difficult to do if you have an infant or young child. To help muffle the occasional cries and noises, nail the cartons to the walls of your makeshift safe room. If you don’t have a specific safe room, you can nail them onto the inside of the walls of your house to muffle sound. It may not look magazine photo ready but it will muffle the cries of your infant or everyday noise from your kids from people passing by who may want to do you harm or steal your supplies. Use as food source in worm farms. There are many reasons for preppers to keep a worm farm. Cardboard egg crates can be used to feed those worms. Worms are useful for fishing bait, they are great for your compost pile, and their natural digestive process improves soil over time. And each worm can eat their weight every day in food, which means they help break down leftovers and other trash so you don’t have to worry about it piling up during a SHTF situation. For soil that is too wet, add carton pieces that are dry and for soil that is too dry, wet the pieces down before adding them to the worm farm. So, start saving those egg crates! Better yet start using them right now around the house to reduce the amount of waste you send to the landfill but also to save yourself some money. All of the kid activity ideas can be done at any point, you don’t have to wait for a SHTF scenario. Pull one out the next time the kids get bored and see how much fun they can have reusing egg crates!